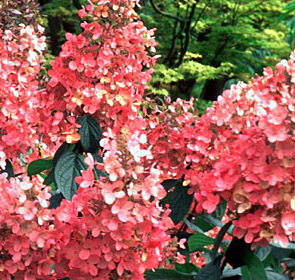 Of the colored hydrangeas Pink Diamond is my personal favorite due to it's bright bloom and fall color. It is not a small plant, but a large shrub to 6 feet tall. In the landscape this plant should be used as a lone specimen or massed in the larger landscape where it can be viewed from a distance. However, pruning once a year can maintain it's form to about 4'. White blooms appear in 12-inch long and 8-inch wide panicles in midsummer and fall; as the flower clusters age they take on a delicate pink blush. Unlike older forms of this shrub, Pink Diamond holds its blooms upright. This large shrub needs room to spread and do its thing, so site it carefully in the landscape. These are shipped in containers with soilless media and a 9 month slow release fertilizer.